In 1890, Mr. Thomas Rushworth of 61 Saddler Street purchased an old building at 40 North Bailey. Son of Timothy Rushworth, a Yorkshire-born carver and gilder who arrived in Durham fifty years before, he was born in the city in 1851 and, by the 1890s, had become not only an authority on art but also a really enterprising tradesman. Since the destruction of the old theatre of Saddler Street in 1869, Durham had no building suitable for public entertainment (except for the acoustically wretched Town Hall). Noticing that, Mr. Rushworth demolished the old building in North Bailey and erected the new Assembly Rooms Theatre. 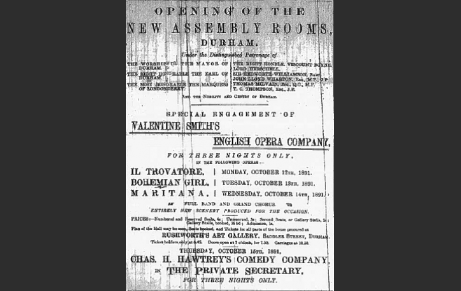 Designed by Mr. Rushworth’s brother William, the Assembly Rooms was inaugurated on Monday 12 October 1891, the famous Valentine Smith’s English Opera Company performing Giuseppe Verdi’s ‘Il Trovatore’ (Durham County Advertiser of 16 October 1891). Initially, the theatre hosted operas and concerts as well as bazaars, balls, dinners, lectures and amateur performances. At the end of the century, however, the so-called ‘animated pictures’ made their appearance in Durham. In 1909, Mr. Rushworth’s announced that his famous theatre had been converted into a ‘picture theatre’, the first cinema in the city. Thanks to the “movies”, the Assembly Rooms’ patrons had a new sort of entertainment: real life events, both national and local. In March 1901, the cinema’s audience could watch Queen Victoria’s funeral; in April 1913, even the installation of the Duke of Northumberland as Chancellor of the University of Durham was filmed and screened by Mr. Rushworth at the Assembly Rooms (Durham County Advertiser of 1 March 1901 and 2 May 1913). Together with pictures of these important events, films of war and military life images were also particularly appreciated by the people of Durham. By the 1910s, however, the audience’s interest in this sort of film had particularly increased. In February 1911, ‘Life in our Navy and Army’ was shown at the cinema hall. The images, filmed in the 1890s, had already been screened by Mr. Rushworth twelve years before, in 1899. This time, however, the Durham County Advertised (24 February and 3 March 1911) reviewed the film saying that it was both “marvellous and inspiring” and could “teach patriotism by pictures”, stimulating “interest in these two most important Services”. When the war broke out, the ‘Latest War News’ appeared in the Assembly Rooms’ programmes along with images of British and allied troops and military comedies and dramas. In November 1914, Mr. Rushworth screened the film ‘For the Empire’, “which shows what would happen “if” the Germans were to invade England” (Durham County Advertiser of 6 November 1914). This sort of images were the perfect entertainment in a time in which “patriotic subjects” were “all the rage” (Durham County Advertiser of 13 November 1914) and people were literally thrilled to watch them. Despite this enthusiasm, the city had already started facing the brutality of war. In November 1914, Mr. Rushworth invited the seventeen wounded Belgian soldiers (and one wounded Britisher) quartered in Cranmer House (North Bailey) to attend a performance free of charge, extending the invite to all the guests of the House (Durham County Advertiser of 6 November 1914). Christmas passed without news of a forthcoming peace and Mr. Rushworth tried to contribute as much as possible to the needs of his country at war. 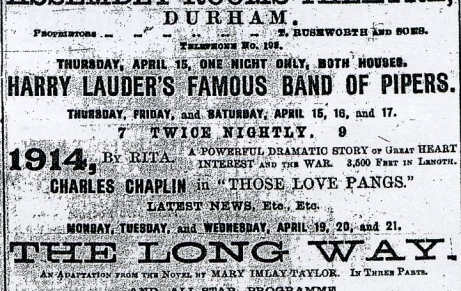 In 1915, the Assembly Rooms screened many all-British productions that could arouse “the patriotism of the audience” (Durham County Advertiser of 5 February 1915), provided performances in aid of British soldiers and hosted recruiting meetings. On 15 April 1915, Harry Lauder’s famous recruiting pipe band played in Mr. Rushworth’s cinema hall. The band, set up by the worldwide known Scottish comedian, was touring Scotland and England to recruit men. Needless to say, it was an indescribable success and many recruiting officers attended the show “to take the names of any man desirous of joining the colours” (Durham County Advertiser of 9 April 1915). Tom, Mr. Rushworth’s second son, enlisted in August, while William, his first one, died the same year in Newcastle. In March 1916 conscription was introduced and many changes affected cinema halls as well. According to D. R. Williams, the Assembly Rooms’ “long-time chief operator, W. A. Waldie, was in no danger of call-up” (Cinema in a Cathedral City, p. 124), but from 15 May 1916, a war tax forced Mr. Rushworth to raise the tickets’ prices. By November, he also had to reschedule the shows: cinema halls were required to close at 9.30 from Monday to Friday and Sunday performances were forbidden. 1916 was also the year of British Government’s official war films. The Assembly Rooms screened ‘With the Indian Troops at the Front’, in January, ‘The Making of an Officer: with the Artists’ Rifles at the Front’, in February, and the Australian film ‘With the Dardanelles Expedition’, in April. The greatest event of the year, anyway, was definitely the screening of the film ‘The Battle of the Somme’, that took place at the Assembly Rooms from 25 to 30 September 1916. The performances had been advertised by Mr. Rushworth since the end of August and both his patrons and the press couldn’t wait to watch the famous picture. 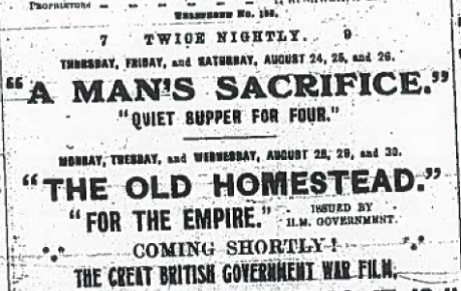 The film, issued under the Authority of the War Office, was considered “the greatest and essentially the most realistic the world” had ever produced (Durham County Advertiser of 22 September 1916). Almost two months after, from 13 November, it was the turn of ‘The King on the Somme Battlefields’, an “historic and official pictorial record of His Majesty’s visit to the Army in France”, “which may be regarded as an appropriate supplement to the Somme film” (Durham County Advertiser of 10 November 1916). In 1917, military pictures continued to be screened at the Assembly Rooms, together with the news of the endless war. In January, Mr. Rushworth offered to his patrons the Italian war film ‘On the Way to Gorizia’ and the French official war picture ‘Guns and Munitions’, but other spectacular British productions were also about to come. 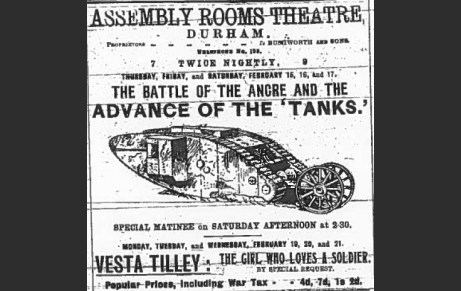 From Thursday 15 to Saturday 17 February 1917, the people of Durham could watch ‘The Battle of the Ancre and the Advance of the Tanks’, a War Office film showing “the various phases of the great battle from start to finish” and “the ‘Tanks’, those weird monsters which created such consternation among the Germans, and such hilarity” among British men (Durham County Advertiser of 16 February 1917). From the end of April to the beginning of June 1917, the official war film on the Assembly Rooms’ screens was ‘Sons of Our Empire’, in ten episodes. According to the Durham County Advertiser, in the fifth and seventh episodes of this film it was possible to see the Faithful Sixth and the Northumberland Fusiliers in action. By 1918, the ‘Latest War News’ had disappeared from Mr. Rushworth’s advertisements in the local press and the Assembly Rooms’ programmes were about to change again. “Fine patriotic subjects” (as journalists used to call them) were still screened, but people were definitely far less excited to watch battle and war pictures. From July to September 1918, the Assembly Rooms showed ‘My Four Years in Germany’, in which the American ambassador J. W. Gerard reported his life among the enemies; but events to contribute to the war effort were no more hosted in the cinema hall. On the Durham County Advertiser of 12 July 1918 good news were announced: Tom, Mr. Rushworth’s son, had been decorated “with the Military Cross, for conspicuous gallantry during the battle of the Marne”. In November 1918 the war was finally over and the Assembly Rooms had to go back to normality. By April 1919, restrictions on cinema opening times had been abolished and Mr. Rushworth could restore the original evening performances of 7 p.m. and 9 p.m. Though new issues about films’ morality and picture hall safety were arising, the Assembly Rooms’ business went ahead full sail until 1923, when Mr. Rushworth’s most reliable partner, his son Tom, died from a war related disease. Only one year after that terrible event, Mr. Rushworth passed away in his home in South Street, aged 74. As reported by D. R. Williams, the cinematograph licence was transferred to Mr. Rushworth’s daughter Grace, who, unfortunately, continued her father’s tradition “of showing innovative films” for only a few years (Cinema in a Cathedral City, p. 149). In 1930, the Assembly Rooms building was sold to the University of Durham; the last film on the programme, ‘Emerald of the East’, was screened on 15 March of that year. Almost 39 years after its opening, the Assembly Rooms, Durham’s first cinema, had permanently closed as a picture hall.